I’ve been thinking about angel wings this past week. I thought I was all set to hook the wings on my Tombstone Angel rug. Apparently, I was wrong. I tried three different combinations of dusty lavenders and greens, which just didn’t work. I love those colors together, so this was a bit disappointing. Delving into my rather extensive wool stash, I came up with a series of mossy greens. I hooked the lightest hue at the top of the wing and worked my way down. I looked at this for a few days to see if I liked it. I do. Then the final tweak was to “reverse hook” the brown over-dyed wool that I had used between the feathers and replace it with some leftover off-white wool that I had spot-dyed with dark khaki for the German Shorthaired Pointer rug that I finished recently. This echoes the pale marbled look of the angel’s face. This past week, I was also aware of angel wings when our beagle-mix rescue, Benji, grew his wings and flew to the Rainbow Bridge. This is always a painful thing to go through. I have had many dogs in my life and it never gets any easier. But he was sick for a long time and he told me he was ready to go. I’ve put a photo below of him when he modeled for my Hutchinson-esque rug that I designed and hooked a few years ago. Fly high, Benji. 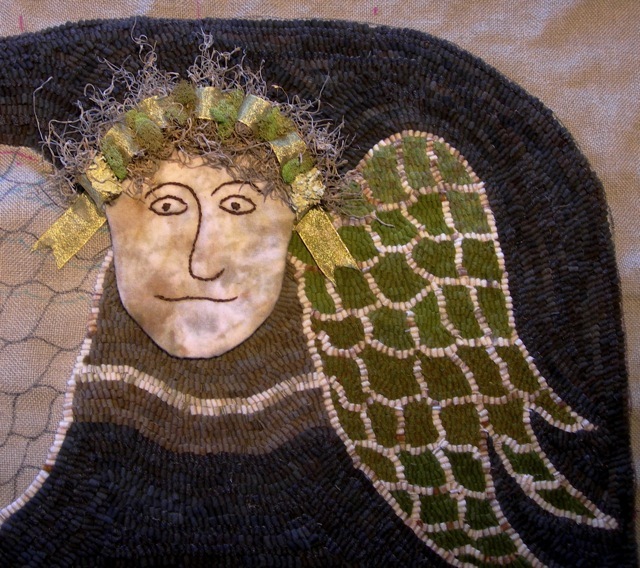 This week I will finish hooking the Tombstone Angel rug and hopefully start the gift rug I want to hook. I’m not even settled on a design for that one, so I’d better get a move on. There’s a lot of beauty out there and in the angels that fly around all us. I think she likes her wing. One more to go! Benji is immortalized in my Hutchinson-esque rug. Benji in his favorite pose.